Stayed at Interhouse Bishkek for a total of 8 nights and loved it. 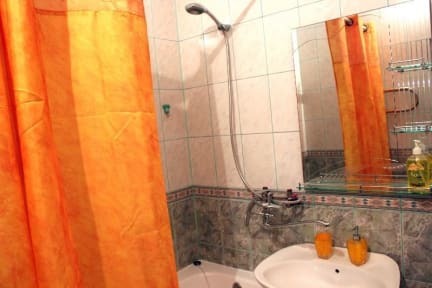 Really feels like home, very clean, warm showers and good heating system (which is something you look for when you're in low season like I was). The staff is so welcoming and helpful. Would highly recommend. I checked in but unfortunately my plans changed so I had to leave same day. Nice place, anyhow. Friendly staff. Good location! Extremely nice staff who speak AMAZING English and are very knowledgeable and helpful about the city and fun things to do! I would 100% stay here again my next time in town. An absolutely fantastic stay! We miss it already! Thank you so much for the great hospitality! The staff is so friendly and welcoming. 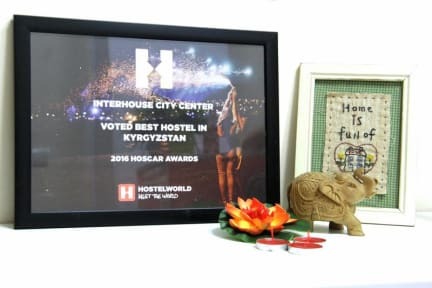 The hostel itself is perfectly balanced between attractions such as the Osh Market and downtown, and there are plenty of grocery stores and eateries in the surrounding area. I will say beware getting there, however. On Google Maps there appears to be two "Interhouse City Centers", and one of those buildings is definitely shut down and not the hostel. If your taking a taxi there, make sure they know to go to the hostel on Toktogul St and Manas Ave! Great place. I would suggest using a large legible sign on the street that points to where the hostel is. Also a sign BEHIND the gate pointing to the entrance door. Good internet. Staff were great. A good hostel, easy to get to and fairly quiet this time of year. A little too hot for my taste, but I know I’m in the minority there. Good free breakfast, fast WiFi. Would stay again. A good hostel, although I think some people from Tjakjikistan almost lived there. I guess to fill it up during low season. Small, cosy hostel in a great location; clean, really comfy and the staff are always friendly. 3rd time staying here and def my go-to hostel in Bishkek.